This delegation was composed of 17 participants. It was one of the largest GSC has sponsored over the last four years. TSSA sponsored MPs, candidates, trade union officers and contacts contributed significantly to the numbers. 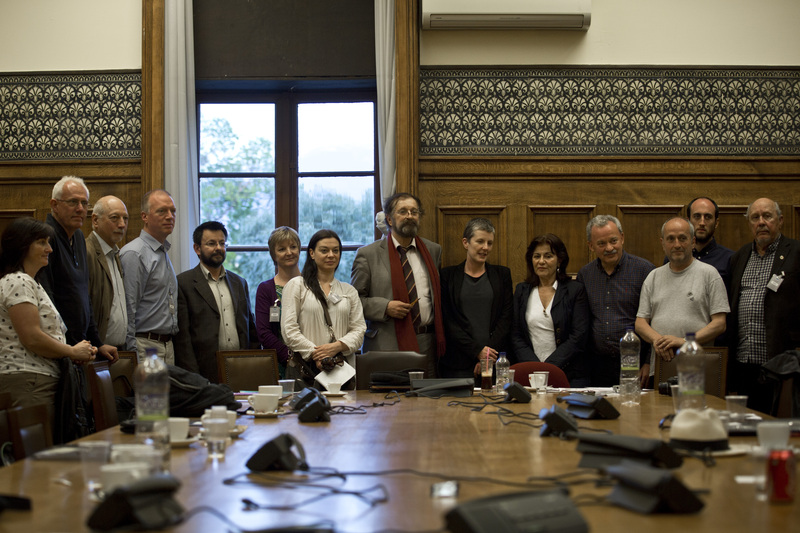 A 17 strong Greece Solidarity Campaign delegation visited Athens in mid October. 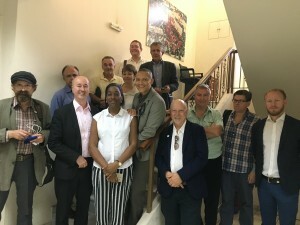 Leading representatives of the Save Lewisham Hospital Campaign, TSSA, Unite the Union, RMT, the Chartered Society of Physiotherapists, People’s Assembly, People’s Charter and a new Labour MEP joined GSC delegates on the 3 day visit. The delegation visited a ‘Without Middleman Market’, the biggest hospital in Athens-Evangelismos, a Social Solidarity Centre supporting local families and a Social Solidarity Clinic providing free health care to the thousands with no health cover. 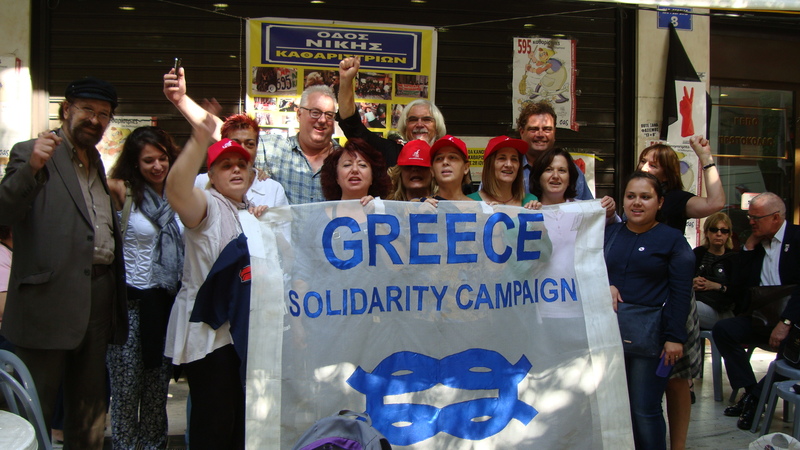 The delegation had meetings with the sacked women cleaners camped outside the Finance Ministry for over a year ( see pictures above), the all Athens Committee of Social Solidarity Centres, Evangelismos hospital doctors, nurses and union convenor (see picture above), the public sector union ADEDY, the volunteer staff of Peristeri social solidarity clinic and the network Solidarity for All. 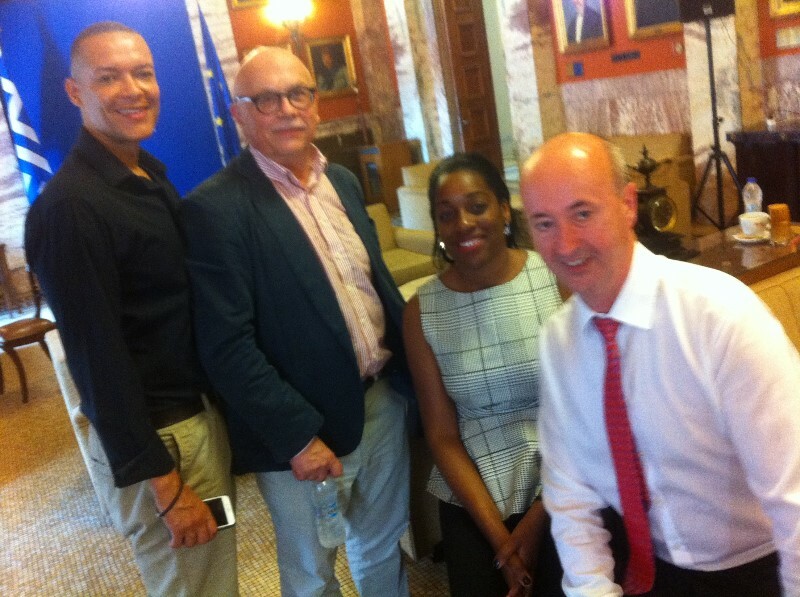 We also met anti-austerity politicians – Syriza Leader Alexis Tsipras and Syriza MPs in Parliament and the recently elected regional governor and deputy governor of greater Athens – Attika. 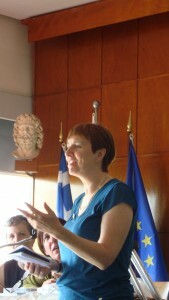 See the report ‘What ‘austerity ‘has done to Greek healthcare’ by Dr Louise Irvine, chair of Save Lewisham Hospital Campaign, seen here speaking in Evangelismos Hospital, Athens. Greece Solidarity Campaign secretary Rachel Newton, co-chairs Paul Mackney and Isidoros Diakinides and treasurer Cherry Sewell. 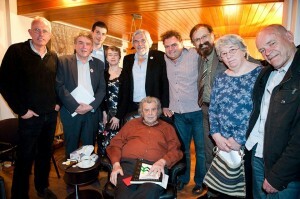 The meeting was reported in the Greek media. Watch the short video interviews of Mary Usma ,Unite Justice for Cleaners branch member and Paul Mackney, co chair of GSC explaining why the GSC delegation is there. 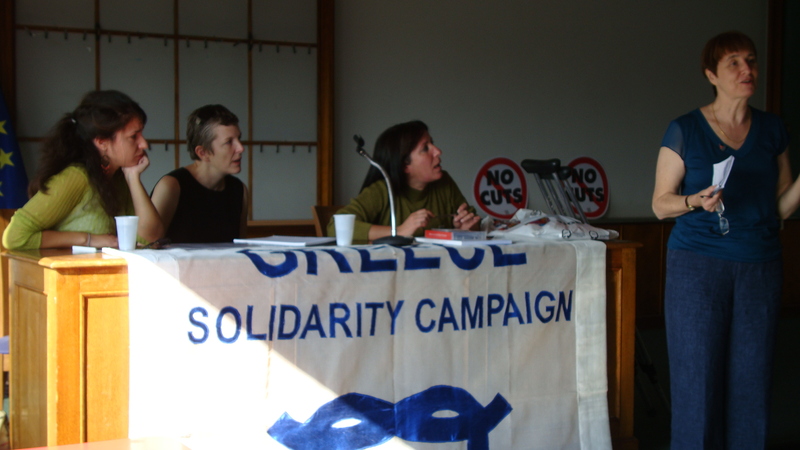 As some of you may be aware, outside of my role as the General Secretary of our union, I am also the President of the Greece Solidarity Campaign – an organisation to which our union has been affiliated to for a number of years. This is a responsibility which I took over following the sad death of veteran Labour politician and strong ally of working people, Tony Benn. 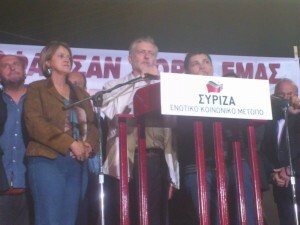 The campaign was initiated by Tony in response to a request for solidarity from the Greek people as austerity started destroying the social and economic fabric of their society. 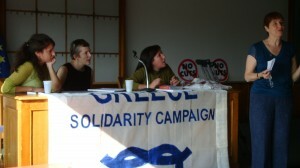 I recently took part in solidarity delegation to Greece (which I funded myself). It is clear that ordinary people are paying an incredibly heavy price for austerity, with the economy continuing to shrink, having already contracted by over 20% since 2008. This has resulted in an unemployment rate of almost 30% with a truly shocking 60% of young people being out of work. Like in Britain, it was not ordinary Greeks who sat on the boards of the financial institutions whose unfettered greed brought our economies to the edge of the abyss. The Organisation for Economic Cooperation and Development has recently said that almost 18% of Greeks haven’t got enough food to adequately feed themselves. The campaigners we met said that this figure was in excess of 25%. In the 21st Century, this is completely unacceptable! You won’t know it from the way the Greek people are portrayed in our popular press, but prior to the crisis, Greeks worked among the longest hours in Europe and their wages were below the EU average. Fortunately, there are strong historical links between the people of Greece and Britain stretching back a very long time. In fact, following a coup in the late 60s, the solidarity of people within our shores played a crucial role in helping sustain a viable opposition to military rule. This is a tradition we should all be proud off. Perhaps most worryingly, Greece’s healthcare system is collapsing. In 2008 Greece had 120 public hospitals, but a government closure programme will cut this to just 80. A third of all clinical staff have also been dismissed. We heard from doctors, nurses, radiographers and physiotherapists who all told us who they can no longer cope with the demands placed on them due to the cuts. 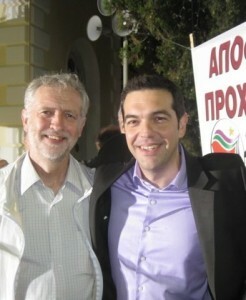 What makes things worse is that unlike our NHS, the provision of healthcare in Greece is based on an insurance system. If you are out of work for a year you lose your access to free healthcare. Frighteningly, there are currently over 3 million Greeks with no access to healthcare – almost 30% of the population. This is the equivalent of almost 19 million people in Britain not having access to healthcare. Frankly, this simply reinforced my view that we must always fight incredibly hard to keep our NHS open to everyone and free! Inspirationally, ordinary people have reacted to this crisis by setting up solidarity clinics. There are between 10,000 to 15,000 volunteers who provide their services for free. A large number of them are health professionals who have either recently been laid off or simply put in an extra shift during their day off or after completing a days work. I spoke to several GPs who had opted to leave paid employment to work for free in solidarity clinics. I also met professors working in university hospitals who are now providing services for free. I am humbled by the ingenuity, dedication and solidarity shown by these people. If all of the above wasn’t bad enough, the price of prescriptions has also skyrocketed. Sadly, it is the most vulnerable in Greek society who are paying the highest price. Children are not being immunised as their parents can’t afford the price of inoculations. This is where you come in. The people of Greece need our solidarity – they are not looking for charity – but a gift of just £10 can help secure vaccines for children – and send a message of hope and solidarity. 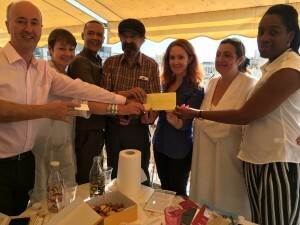 You can find out more about what you can do from Medical Aid for Greece. I very much hope that you will feel able to show solidarity with our sisters and brothers in Greece. 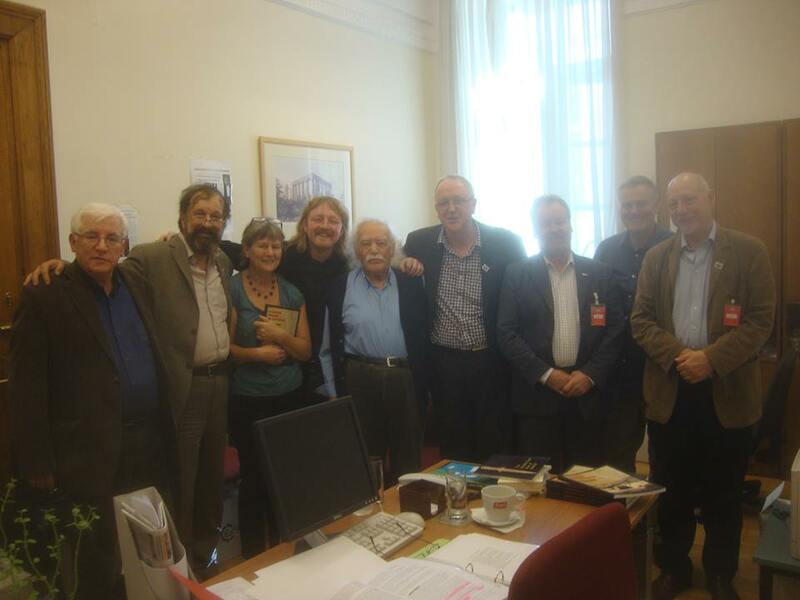 This delegation consisted of Tony Simpson (Bertrand Russell Peace Foundation), Simon Renton (President UCU), Mary Compton (Former President, NUT), Cllr Isidoros Diakides, Mike Davis (Editor, Chartist), James Youd (Treasurer, GSC), Bob Archer (co-ordinator). 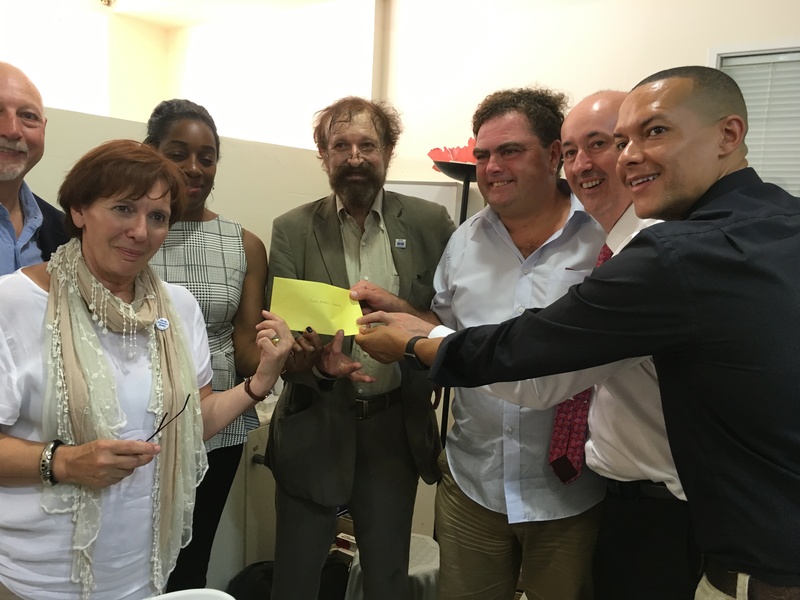 Tony Simpson of the Bertrand Russell Peace foundation and member of the October 2013 GSC delegation reported the visit on his blog. Read it here ‘ We are all Greeks’. ‘Feeling a way to new modes of struggle’. ‘The situation facing teachers and schools in Greece is one of the sharpest in the European Union. Ever since the financial crisis hit Greece, public services and in particular education have been consistently and viciously attacked in an effort to placate the Troika and behind them the bond holders who are making a killing by betting on sovereign states like Greece. …..
Matt Wrack, General Secretary, Fire Brigades Union ; Dave Green, National Officer, Fire Brigades Union; Sharon Riley, National Officer, Fire Brigades Union; Geoff Revell, Peoples Charter and RMT; Pilgrim Tucker, Community Coordinator, Unite the Union; Jane Beach, Professional Advisor (Health) Unite the Union; Andy Love MP; David Lammy MP; Daniel Trilling, editor and journalist, New Statesman; Mike Davis, editor Chartist magazine; Isidoros Diakides, Greece Solidarity Campaign; Rachel Newton, Greece Solidarity Campaign; Joseph Healey, Greece Solidarity Campaign and Queers Against Cuts; Beniamino Barresse, Greece Solidarity Campaign and independent film-maker. The delegation visited a social solidarity market, met the SolidarityforAll committee, visited a public hospital, two solidarity health clinics, an unemployed and precarious workers’ group, joined a mass anti-fascist march, visited a fire station, met with leading members of the Firefighters union in Greece , members of the public sector unions confederation ADEDY, a leading campaigner on women’s health, LGBT activists and HIV organisations. 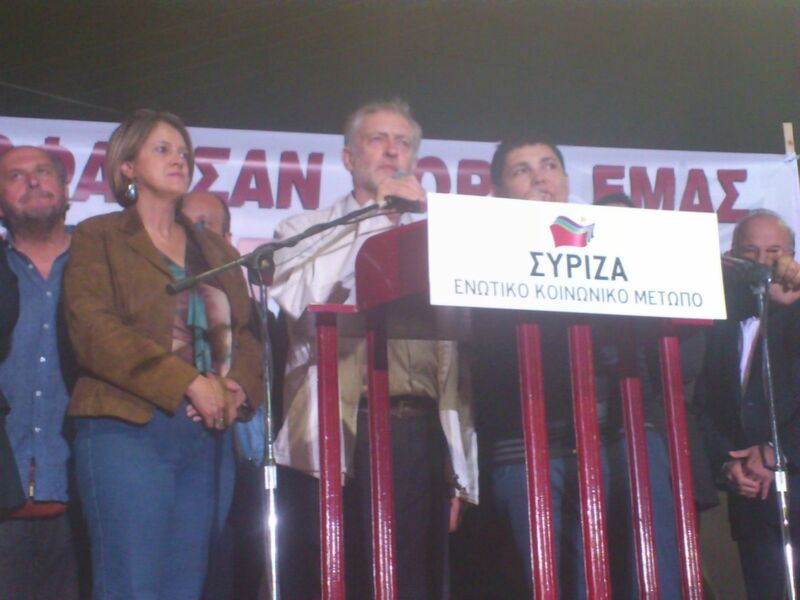 They also met Syriza MPs. Read the speech by Jane Beach of Unite the Union following here visit here. 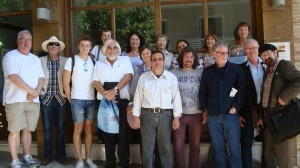 March 2012 The first Delegation to Greece on film! 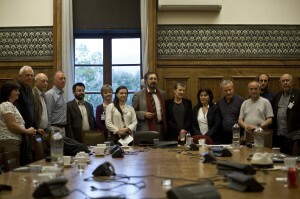 The delegation was organised by the Greece Solidarity Campaign, Coalition of Resistance and People’s Charter. The delegation met trade unionists, anti austerity activists and politicians, Mikis Theodorakis ( in picture with Andrew Burgin CoR, Kate Hudon CND, Paul Mackney CoR,GSC, Manuel Cortes General Secretary of TSSA union, Isidoros Diakides GSC, Dot Gibson National Pensioners’Convention, Dave Rogers Banner Theatre) and veteran anti-fascist Manolis Glezos who together issued a call for resistance to the austerity policies imposed on Greece.